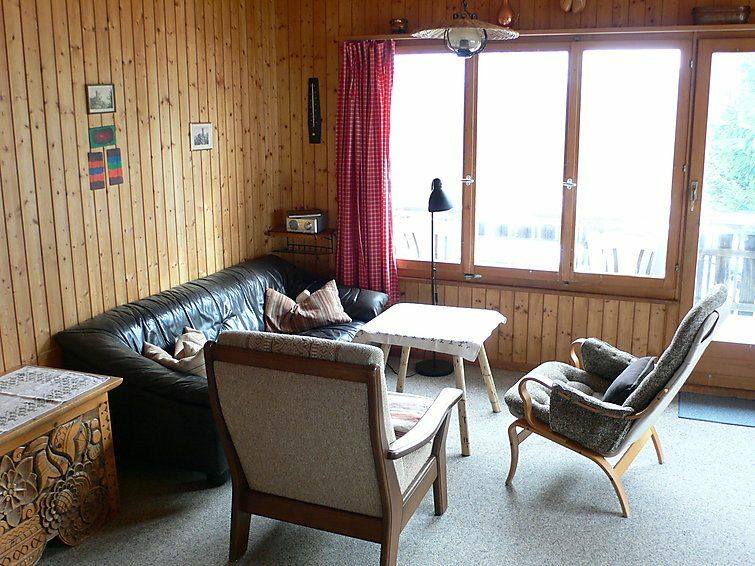 Oberurmein: The chalet is situated in the Ober-Urmein holiday complex chalet "Danis". In a quiet, sunny position, 1 km from the lake, south-east facing position. Private: natural garden. Table tennis. Motor access to the house. Parking at the house. Grocery 4 km, restaurant 4 km, bus stop 1 km, railway station "Thusis" 10 km, outdoor swimming pool 10 km, thermal baths 30 km, bathing lake 1 km. Golf course 30 km, children's playground 1 km. 3-room chalet. Simple furnishings: living/dining room with radio. Exit to the balcony, south-east facing position. 1 small room with 1 x 3 bunk beds. 1 room with 2 beds. Open kitchen (3 hot plates, oven) with electric heater and boiler (100 litres). Shower/WC. Electric heating. Terrace furniture, deck chairs. View of the countryside. Reserved parking. Maximum 2 pets/ dogs allowed.